What is the smallest number of Fredkin gates needed to simulate a Toffoli gate? 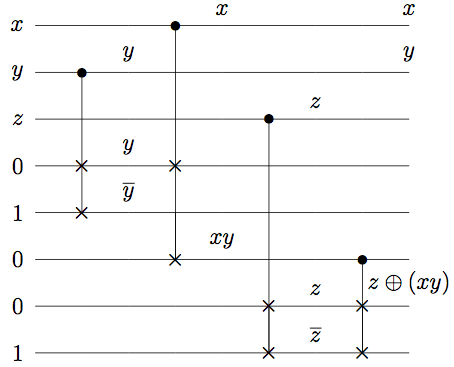 What is the smallest number of Toffoli gates needed to simulate a Fredkin gate? In both cases the answer is 4 gates. A solution for this problem can be found in Andrew Landahl's notes for the course Physics 452/581: Introduction to Quantum Information, University of New Mexico. I quote the author's original solution (with some minor corrections). In both cases, the minimum number of gates required to simulate the other is 4. A proof of such a minimum requires exhaustively demonstrating that 1, 2 or 3 gates is insufficient to achieve the simulation. Such a proof is omitted here and was not required for credit. Unfortunately, intuition seems to be the best alternative to finding the minimum number of gates and the related circuit. By ``exhaustively demonstrating'' the author means that you can just write a computer program that lists all possible gates that you can obtain by combining 1, 2 and 3 Toffoli/Fredkin gates, and carefully check that none of them corresponds to the gate that you want to synthesize. Generally the way you prove something is minimal is by 1) enumerating all possible smaller configurations, or 2) looking at it in terms of a finite set of states, and showing that nothing smaller could hold the necessary number of states. Not the answer you're looking for? Browse other questions tagged homework-and-exercises quantum-information quantum-computer or ask your own question. How to construct this oracle quantum gate? What does it mean that quantum teleportation can be classically simulated? Again: why do quantum computations need to be reversible?